The appearance of flower girls in the wedding party is a long held custom dating all the way back to ancient Rome. While the dresses of flower girls and the items they carry have changed many times throughout the years, many believe that a wedding is incomplete without the presence of a flower girl. The Elizabethan era saw the advent of scattering rose petals along the path the bride would walk, although in this time period the petals were often scattered along the path from the bride's home to the church. 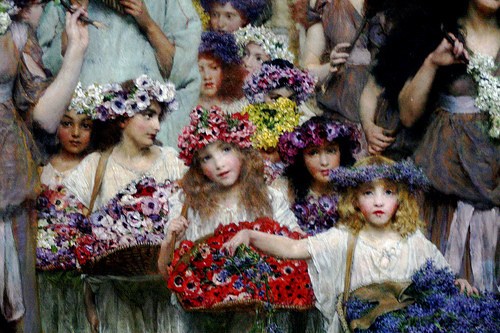 The Victorian era is when flower girls began to look similar to modern day flower girls. Victorian flower girls often wore simple white dresses made with the intention of wearing more than once. They often carried a basket of fresh flowers or a floral hoop that symbolized that true love lasts forever and is without an end. Flower girl dresses changed in style quite a bit through the twentieth century. In the 1920s they had more of a flapper look. Starting in the 1940s it was not uncommon for there to be two or more flower girls in attendance. This was most obvious in royal weddings, such as the wedding of Princess Grace in 1957 and the wedding of Princess Margaret in 1960. The 1950s saw a lot of different fabrics such as lace, satin, and organza. The 1960s rocked the "flower child" look. Empire waist gowns were quite prevalent in the 1970s and sometimes had brighter colors or sported different patterns. In the 1980s the trend was for the flower girl to carry dried flowers. Princess Diana was a huge influence on the 1980s. The 1990s saw an influx of more casual style dresses. While the dresses of the past century have seen a lot of change, flower girls are still recognized as an important part of any wedding ceremony. It will be interesting to see how the trends of flower girls will evolve in the future.